Lack of trading discipline is the primary reason for intraday trading losses. Trading discipline has to focus on three things. Firstly, there must be a trading book to guide your daily trading. 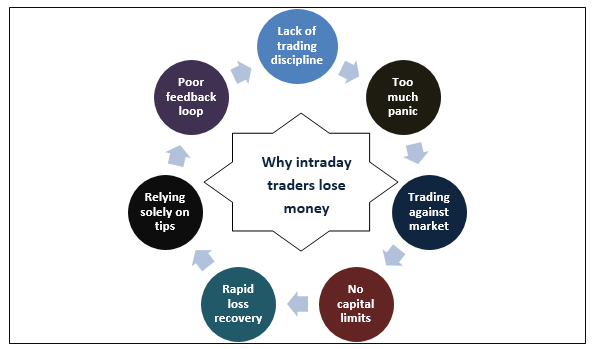 It is estimated that nearly 80-85% of intraday traders end up losing money in the stock markets. Normally, 70% of the intraday traders do not last beyond the first year and 90% do not last beyond the third year. What is the reason for this phenomenon and why do intraday traders lose money so consistently? There are 7 key reasons for the same. This is the primary reason for intraday trading losses. Trading discipline has to focus on three things. Firstly, there must be a trading book to guide your daily trading. Secondly, you must always trade with a stop loss only. Thirdly, you need to keep booking profits at regular intervals. When any of these aspects of disciplined trading are compromised with, it leads to losses in intraday trading. Trading discipline is critical because as an intraday trader, your primary focus must be to protect your capital and limit your losses. One of the basic reasons traders lose money in intraday trading is due to panic. In the stock markets when you panic, you actually subsidize the other trader who does not panics. Profits always flow from the trader who panics to the trader who does not panic. When you panic in intraday trading, you tend to cut your positions too soon. You require a basic amount of risk appetite for intraday trading, but your risk should be properly managed. The key rule is not to panic just because the market is showing signs of volatility. For a long-term investor, taking a view against the market may be productive in the longer run. But if you are a trader, then you must ensure that you always stay on the side of the market. As Jesse Livermore, the legendary stock trader, rightly said, “In trading, there is no bull side and bear side; there is only the right side.” The right side for traders is the side of momentum. Always trade on the side of momentum and never try to outsmart the market. That is a recipe for losses in intraday trading. This is an essential part of your trading discipline, especially when you are trading intraday. You need to put limits on your maximum loss at various levels. Each trade must be accompanied by a stop loss. You must set limits for losses for every trading day. If the losses happen in the first hour, have the discipline to shut your trading terminal for the rest of the day. Have an overall capital loss limit where you will get back to the drawing board and revisit your entire trading strategy. This is your insurance against trading losses. This is a common problem among a lot of intraday traders. When they incur a loss, they either try to average their position or try to overtrade aggressively to recover that loss. This will only lead to more losses. When you incur a loss, it means the trade was wrong. When you average or overtrade, you are just being wrong twice. Losses are part of your trading process and that is why limits are set and adhered to judiciously. A big challenge for intraday traders is how to trade and what stocks to trade. While brokers do provide trading ideas to clients, quite often traders also rely on external sources for tips on trading. That is best avoided. The best way to trade intraday is to gradually master how to read charts and how to interpret news flows and trade on your own. It is a slow process but there is really no alternative to learning methodically and trading on your own. One of the key steps in intraday trading is to ensure that the feedback loop and the learning process are complete. Ideally, the intraday trader must maintain a trading diary that documents the trades, the justification for the trades and the review of trades each evening. This will work as a basic manual for the intraday trader’s continuous learning process. Most intraday traders lose money because they do not get the small things right. Take care of the micros and the macros will take care on their own.